From the Manufacturer: This tamper is perfect for anyone who wants the weight and the correct pressure applied on the coffee powder. 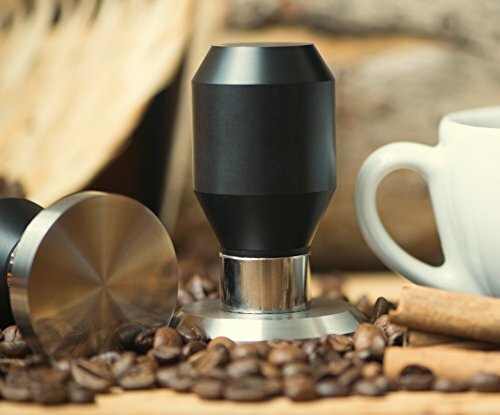 We know the importance of a quality espresso tamper to optimize a shot of espresso. These coffee tampers provide the quality you need with style at affordable price. Not dishwasher safe. Buy with confidence: We only use top quality material for work. We always ensure my customers are satisfied with their purchase and get quality for their money. Tamping is a very important step in the espresso making process. Tamping compresses the ground coffee, slowing the rate at which the espresso is extracted, liberating the full flavor of the coffee. Coffee prepared without tamping will tend to be watery, have a straw like flavor, and will lack crema. How to choose the right Tamper size? When choosing a tamper, it is important to select one with the diameter appropriate for your machine. If your tamper is too small for the basket, certain areas in your 'puk' will experience higher pressure than others, which will result in uneven extraction and a very unpleasant cup. There are two options: 1.To measure the basket. We do not recommend this option, because it needs an equipment this appropriate accuracy and skills to use it. 2. Find machine specification that describes the exact brand model or to contact the manufacturer of the coffee machine for that information. Please do not order the tamper/ base if you are not sure about the size! Customers' feedbacks: "Super high quality product!!! Fast shipping! Only +++++++!" "Exact requested custom dimension." "Good product. Good value. It looks nice next to my espresso maker." "Just what I needed. I can finally tamp my espresso grounds without getting them all over the kitchen!!!" "Nice tamper, excellent seller. Thanks" "Fast shipping and great product." "Very satisfied.it feels good and looks good." "top. It works, it looks great, and feels like a quality tool in your hand because of it's weight." Tampers are brand new and never been used. Commercial premium quality, made in Israel. 100% 304 Stainless steel flat base. The handle made from Delrin (a crystalline plastic which offers an excellent balance of properties that bridge the gap between metals and plastics). Delrin possesses high tensile strength, creep resistance and toughness. It also exhibits low moisture absorption. It is chemically resistant to hydrocarbons, solvents and neutral chemicals. Heavy duty.Top quality material. Easy to use and clean. Fits VST basket. The dimensions are: height 8.1 cm (3.2''), weight 300-350 gr (0.66-0.77 pounds)(depends on base diameter). Can be used on most of the espresso machines. If you have any questions about this product by Maya Italy, contact us by completing and submitting the form below. If you are looking for a specif part number, please include it with your message.